I have been at Wikipedia again. This time at the User Story page. I didn't like the contents as usual, and this time I drafted a variation on the Wikipedia page and published it in the Business Analysts Handbook. A copy is recreated below for your interest. It also serves well as a first post in the Agile Thursdays series. A User Story is a marker indicating a request for work to be done. User Stories are often conflated with software or business requirementsbecasue on first impressions they look like requirements. They are actually independent things. User Stories were first introduced to the world by the XP community in the late 1990s, although the concept of stories and narratives being effective tools for communicating requirements daes back at least into the early 1980s. User Stories are ideally written on index cards or similar because of the value of visualizing the workflow , keeping them simple and osmotic communication . 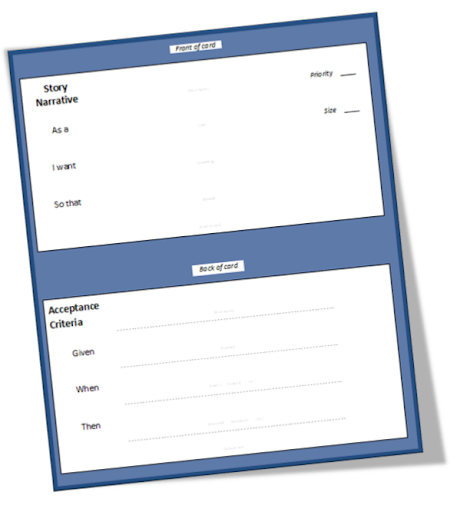 The three essential elements of a User Story are the card, conversation and confirmation. These are described below under the following headings. User Stories are typically written on index cards or post it notes because of the value of osmotic communications, the lightweight nature of the tool and because face to face communication is optimal for project team communications. Many teams also capture User Stories in electronic media such as requirements management or test tools. There are many purpose build product backlog management tools on the market. The benefits of this templated form are real and tangible. An important part of both requirements management and workflow management is effective partitioning or dividing of the model elements into smaller parts. Diving the stories by the user type is a useful technique. Occasionally a feature or service will be identical for multiple users but more often than not there are differences, subtle or obvious, that the division helps surface. The "I want" element generally describes some tangible interaction or feature. Because of this element a User Story is often conflated with a Use Case, a scenario or a feature. And it may well describe any of these or other thing. Software developers usually have a lot to offer in relation to requirements and how they should best be fulfilled. Often they have been constrained by a lack of awareness of the motivation for the requirement. It's also a common client failing to jump to solutions to early. Asking for the motivation in terms of business value helps everyone focus on what's most important in the story. SO explain why in the "So that" clause. But the template has it's detractors. By proving a tamplate in the first place you provide a platform for people to communicate in written form with the idea that the communication is sufficient and complete. Unlike requirements a User Story is not a complete brief. It is aimed at being a trigger for a conversation and is purposefully incomplete so that the conversations can be had to further elaborate understanding collaboratively. A clear definition of done is important for User Stories as they re work requests. By being clear about 'done' teams are better able to determine when they have not yet met the minimum quality and capability thresholds, and when they have gone too far. Where given describes a starting state, when describes a trigger or catalyst and then describes the new state of being. This template form suffers the same strengths and weaknesses as the "As a I want" template.